The folks at Davis Frame Co., a timber frame home company based out of New Hampshire, recently built an off-grid home in Oregon. The large, 265 square meters (2,850 square feet) home is looking quite traditional, however, it was built with a great deal of green features in order to receive the Platinum certification from the Earth Advantage Institute. The house is also completely off-grid. 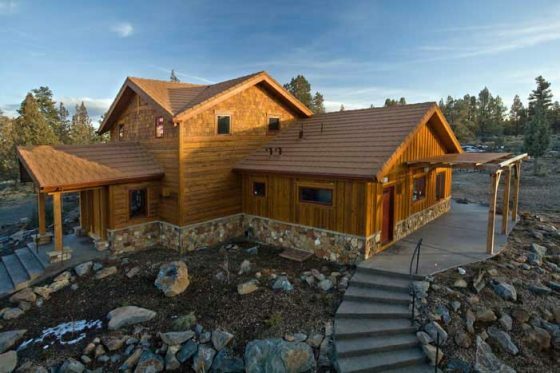 Located in Sisters, this timber frame house is off-grid. In order to build the walls of the house, they used structural insulated panels (SIPs). The use of SIPs has become widely recognized as being far superior to other methods for sealing and insulating buildings. To complement of SIPs, they incorporated BioBased insulation which uses soy-based technology to replace petroleum-based fill that is commonly used in SIP construction. A rooftop passive solar array provides all of the necessary power and a satellite signal provides internet and phone service. All together, Pacific Crest has three bedrooms and an open layout for the great room, dining room, and kitchen. In addition to passive solar design, solar collectors are used to heat the water or provide heating for the home. It also has low-flow plumbing in order to save water. In order to save energy, the house is equipped with Energy Star appliances and LED/CFL lighting. Te materials used for the finishing touches are mostly regionally source, including reclaimed barn wood, aluminum clad low-e windows and low-impact materials. This entry was posted on Sunday, Apr 25th, 2010 at 8:55PM and filed under Architecture, Tech. 4 Comments — Leave your response! Unbelievable that this home is a “green” home. It looks beautiful. Most structures or homes that are supposed to be green look like it came out of Buck Rodgers. This style really says something dont it?! Awesome looks quiet similar like my dream hope …Really like the look of the house…..
Thins kind of home is sustainable yet also sustains the timber suppliers indusrty, something that conventional ‘green’ buildings aim to avoid. Amazing home! I wish all homes in us were green!